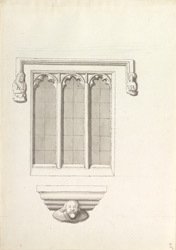 Drawing of a window in the north wall on the outside, and of a bracket on the inside, of Hinton parish church (at Hinton Charterhouse). It is a three light window with cusping, surrounded by a border. There are richly carved humorous figures at either end of the brackets. Hinton Charterhouse was one of the first Carthusian monasteries in England. It was founded in 1232 by the Countess of Salisbury. The monastery was dissolved along with other religious houses in the 16th century. In the late 18th century, when Grimm visited here, many of the monastic buildings were still standing.